When I lived in New York I would sometimes wander a few blocks down from where I lived to the Calypso store. It wasn't really my style at the time, but I when the stress and dirt of the city got to me I loved to pretend for a minute that I was the kind of person that needed a flowy resort wardrobe. Plus the shop smelled really good. So anyway, nostalgia made me tentatively excited about the Calypso/Target collaboration, even though I've found nearly every other one disappointing. This one had me intrigued, though, because everything is cotton, silk, and linen. No slick polyester to be found. 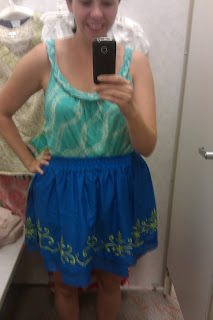 So here is my makeup-less face trying on some actually pretty things. 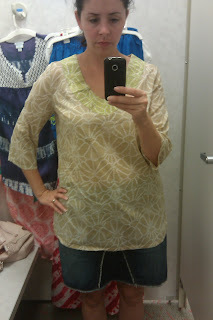 I tried this crochet-bib tunic in two different colors and sizes. the above is the medium, the below is the large. 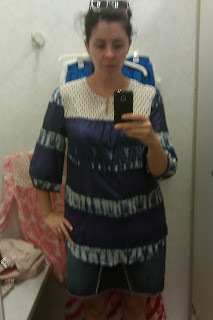 Even though this line is supposedly Juniors sizing, I found it surprisingly generously cut, especially considering that this is Target, and the top is silk. 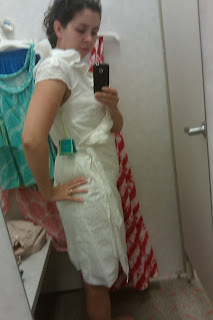 The large was a little bit longer and looser, but the medium fit. This is a lovely, airy, silky top and I liked the crochet. Not something I just have to have for nearly $40, though. I also tried on this cute tunic, which is cotton. The silk felt great on my skin but the cotton version is more practical for me. 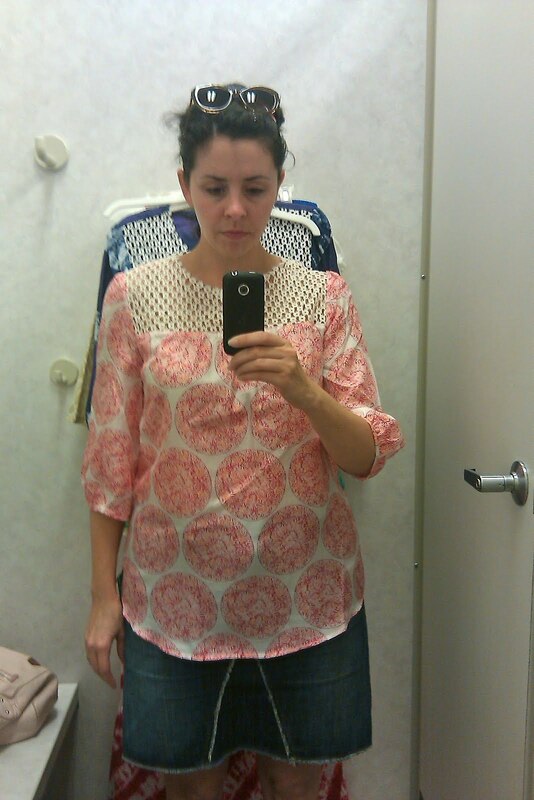 This is a size medium. I was tempted, but resisted...for now. I'm including this one for laughs. Everything was way too big and ill-fitting. I don't know who this skirt is meant for, but it's not me. It's a fun cobalt color, but too full and short. 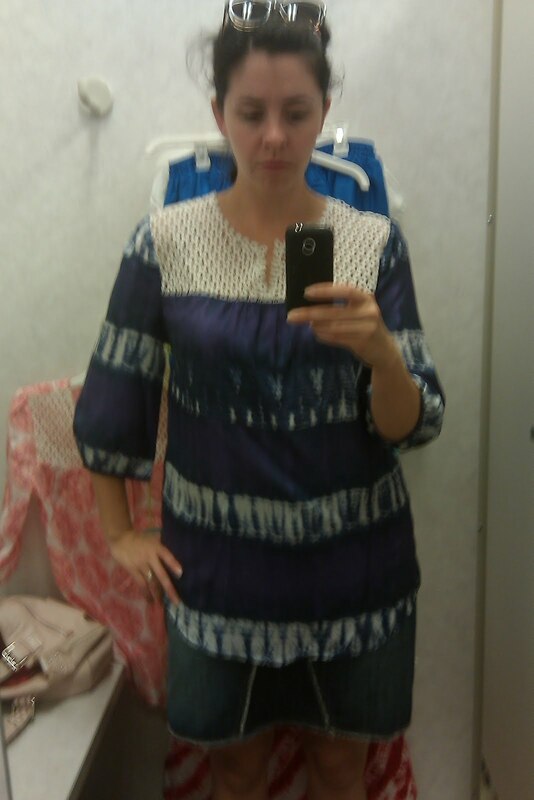 The top has a pretty braided neckline but I obviously did not need a large. I am so used to things running small at Target that I grabbed the wrong size in a lot of things. Which brings us to this dress. I also grabbed this in a Large and it was so big the wrap part almost went all the way around to the back, plus the arm holes showed at least 2 inches of my bra. This is a well constructed wrap dress and I really wish it came in colors other than white or beige. White isn't practical for me and the shade of beige is too close to my skin tone. The ruffle neckline is pretty and the dress is fully lined and feels expensive. I feel like it's going to be super wrinkly, though. But the one thing that I can't stop thinking about? 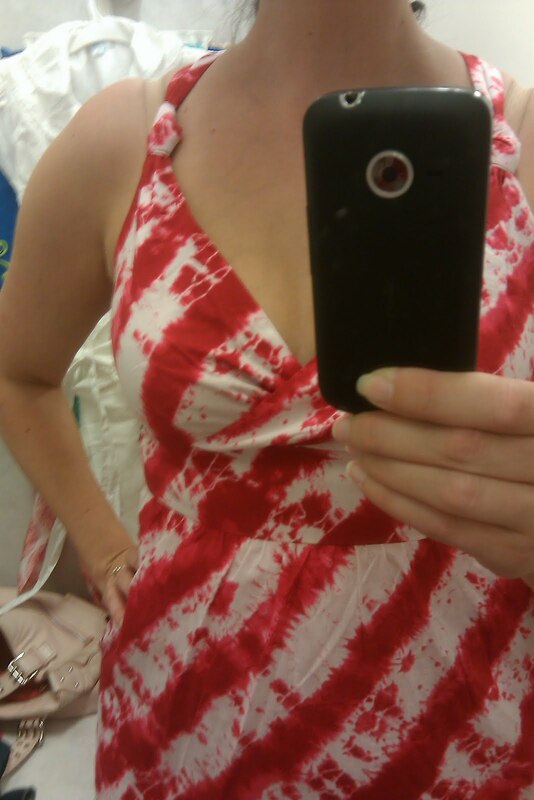 This garish, over-the-top hot pink tie-dyed maxi dress. WTH? Ignore my bra straps and look at the pretty knot detail. 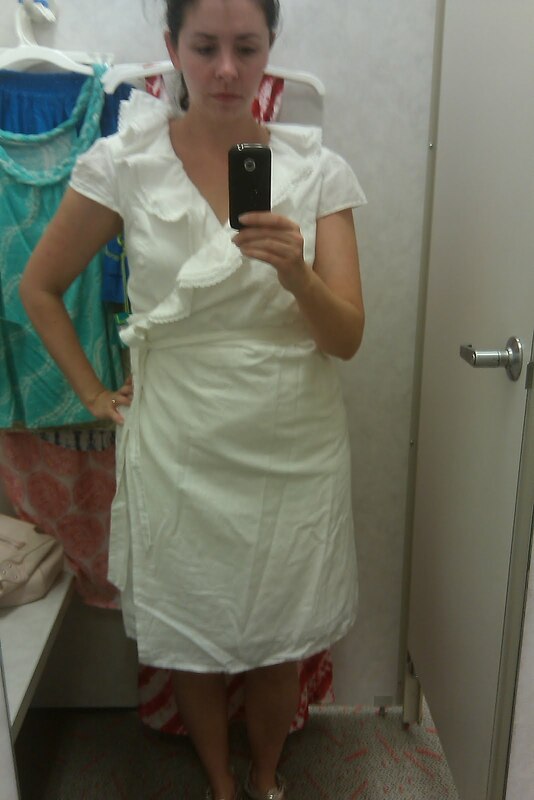 This is a size 8, but I think I'd be happier in a 10. It was snug in the waistband. So readers, your job is to give me a list of occasions I can wear this baby, to justify getting it before it is gone. It's not work appropriate and I can't see chasing Lu around the park, and those are my main activities, so. Go for it. I always pick too large sizes too. I just can't tell from looking at stuff on the hanger. Why not chase Lu around the park in it? Seriously? I love it! 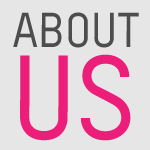 Thanks for the reviews! I too found this collection to run closer to normal target sizing than the junior sizing of other GO collections. 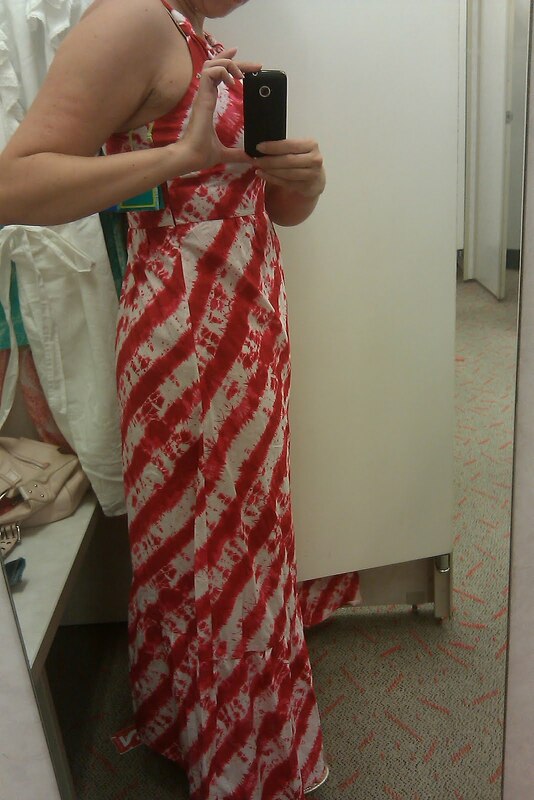 I tried on the maxi dress and loved the shape. It looks super cute on you! I plan on wearing it everywhere! Sigh. I am REALLY regretting not buying it. 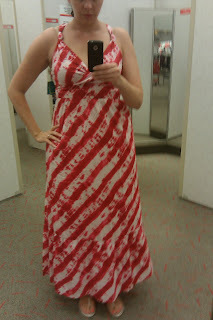 My husband was all "it covers up your hot legs" which is what he says about maxi-anything, and I should have ignored him. Go back to the store and GET IT. 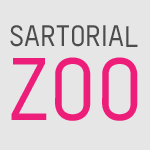 You look amazing in it. And you know men-- they don't "get" fashion. They're all like, "You look nice, honey," whether you're wearing $300 shoes or denim shorts...or both together, of course. I also really like the white dress on you.